After returning from two weeks in Hudson, QC, Canada; I quickly unpacked my suitcase Thursday night and packed a weekend backpack for my cousin's wedding in Minneapolis. I went up to LaCrosse with my parents on Friday night and we stayed at my brother's college house. 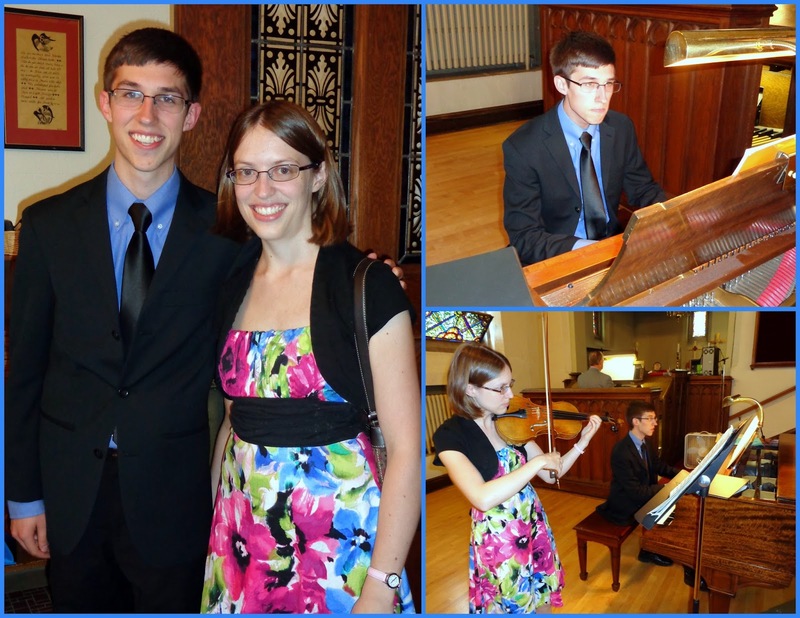 We drove the remaining hours to Minneapolis on Saturday morning, bringing Luke with us. 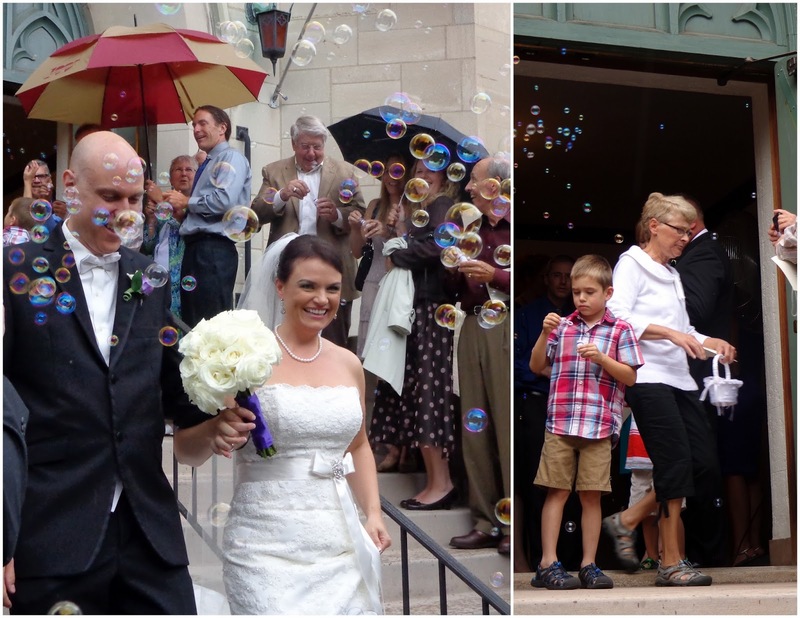 The wedding was held in a Norwegian church, as the bride is from Norway. The reception afterwards was on the shore of Lake Minnetonka. Rather than clinking glasses to make the newlyweds kiss, attendees could go up to the mic and sing any song with the word "love" in it. Papa and I kicked it off by singing the "I love you" song from Barney. The family of this cousin mostly resides in Wausau and Green Bay, so it was really great to see everyone. I always love hanging out with these relatives. I tuckered myself out from dancing on Saturday night, and felt extra exhausted on Sunday by the time we drove back and I got dropped off in Madison. Was definitely due to being on the go and traveling for weeks. Fun wedding though! 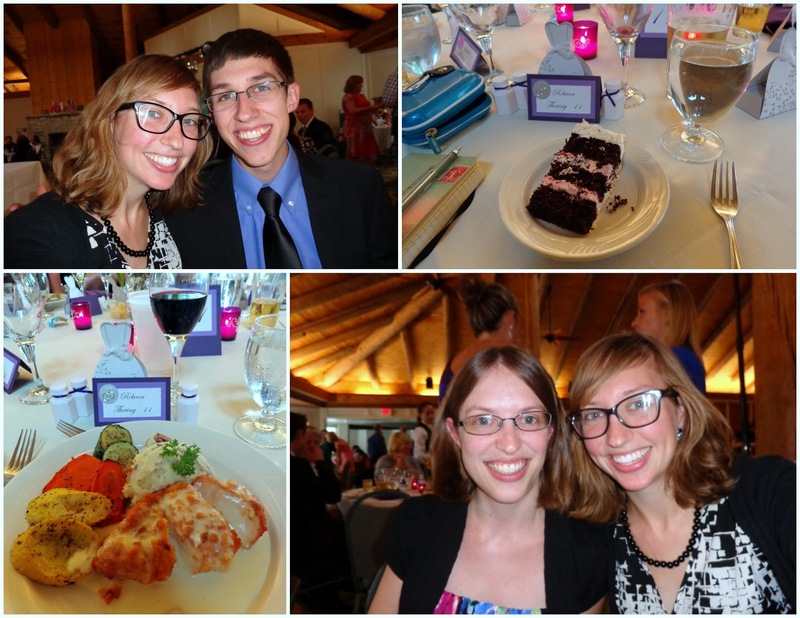 The last wedding I went to was my aunt and uncle's wedding my sophomore year of college, so five years ago? I haven't been to any friends' weddings yet. I'm unfortunately missing one in September, as I'll be out of the country, so I wonder whose will be next. Vamos a ver. On Wednesday morning I stopped in at Hudson's thrift shop and bought a $5 dress for my cousin's wedding this weekend. A good find! I went to work with Hannah in the afternoon of my last full day in Hudson. It was extremely windy and chilly, so we actually didn't go sailing when I was there. The kids worked on a poster of the sailing flags in preparation for their regatta (Fruit Bowl) coming up that weekend. Hannah and I worked on cutting out and attaching numbers to each of her kids' sails. It took more time than I thought, since there are all of these rules about distance between numbers, distance from edge of sail to the first number, etc. We were continuously measuring with a ruler and pencil. Also, these numbers are permanent, permanent -- so they needed to be put on neatly. We finished three of the four sails that afternoon. That night Hannah had some high school friends over for a barbecue. I think six people came, so we were ten people total. A few times during the night I would catch myself thinking about the fact that I would be leaving tomorrow, but I'd have to shove the thoughts out of my head to keep composed. It's a tradition with Hannah's summer junior sailing program to always have an Olympic Day. The different groups each pick a country to represent (or in one team's case, a state -- Hawaii). They wear costumes and decorate their boats, walk in a parade around the club, and then compete in various competitions throughout the morning. 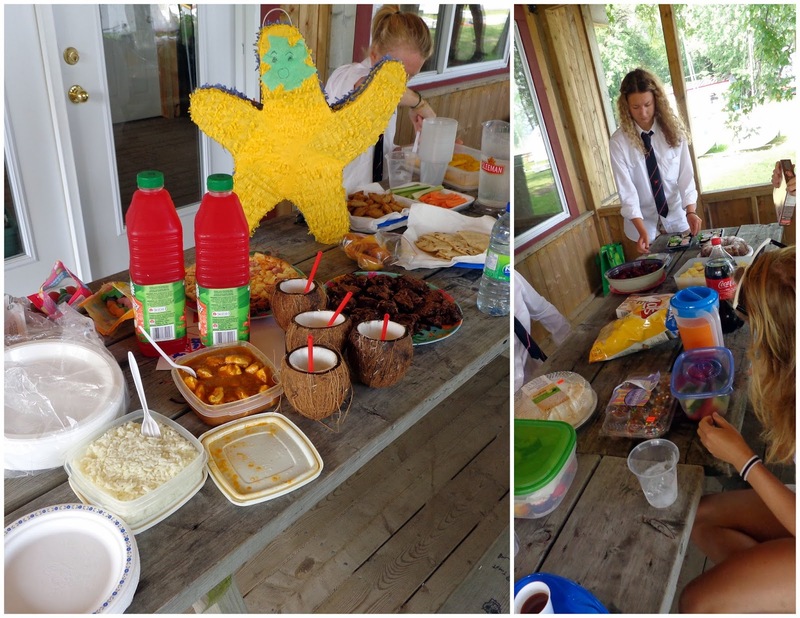 They bring along foods to represent their chosen country, which turns into a big potluck for lunch. In the afternoon they have some races out on the water. All of the elements are scored, and the team with the highest score wins. I guess the coaches have a history of wearing white long-sleeve button down shirts with ties. And here are a few of the teams in front of their boats with costumes. After the boat/costume/bribe judging, the kids paraded around the club to show off their costumes and their sailing pride. I can't believe more kids didn't get injured, to tell you the truth. I helped Hannah count the kids' spins (bottom right) in one of the last obstacles. They had to spin around 15 times before finishing the race. Next up, bobbing for apples... out of a sailboat, claro! Followed by dolly races, two teams of two competing against each other per race. And last but not least, some weird game with a watermelon covered in slippery lard, thrown into the lake. 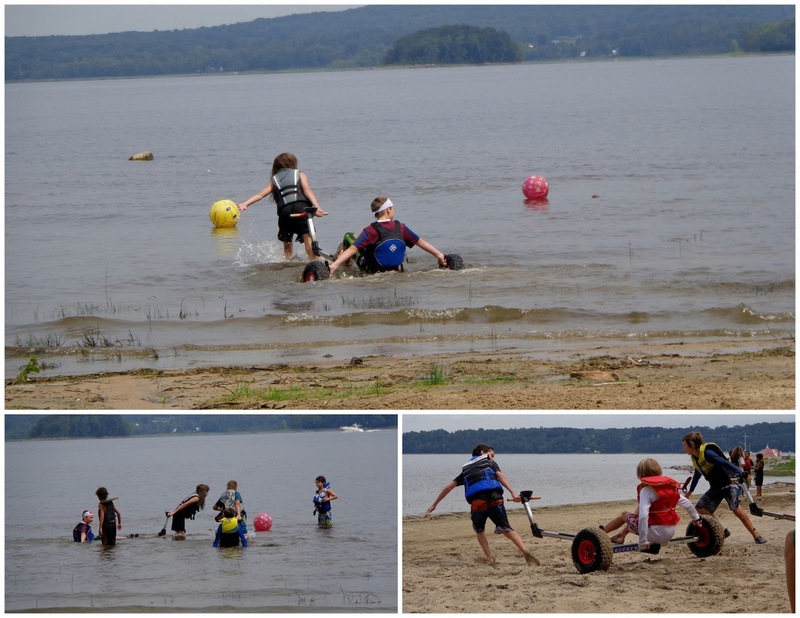 The teams had to try to hold on to the watermelon in the water for as long as they could. 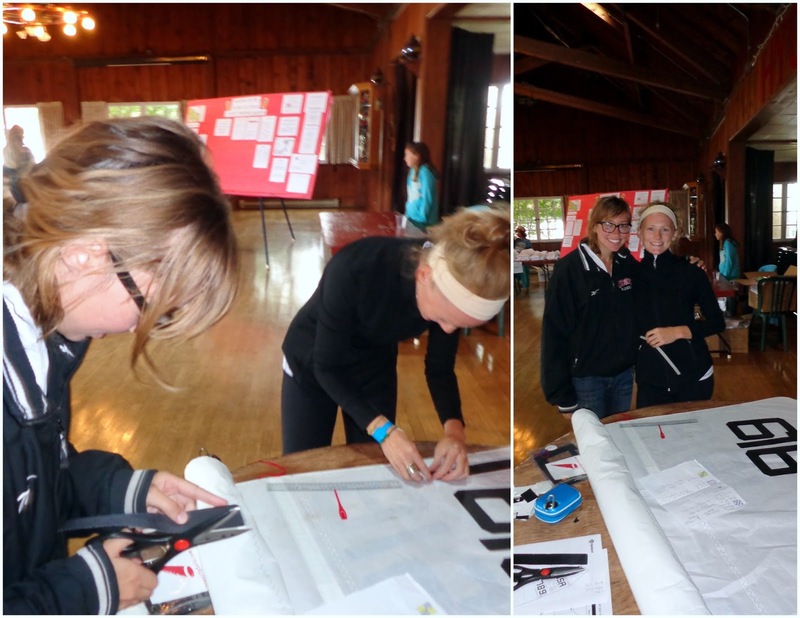 Here's one of the instructors with the day's score board to keep track of points. 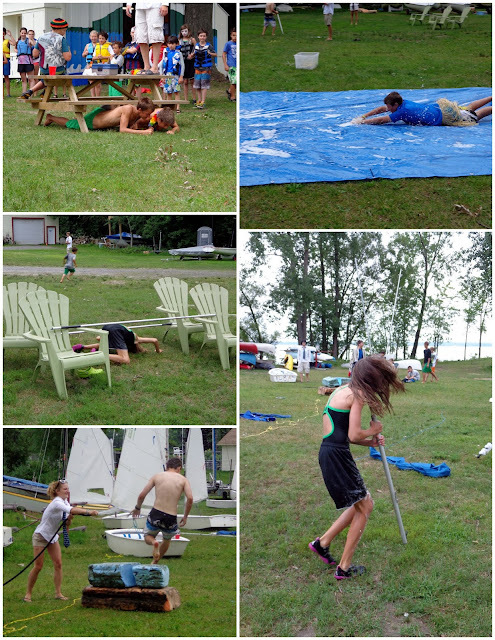 After lunch all of the junior sailors had some races out on the lake. I went to work with Hannah for the whole day today because it was Olympic Day! Check out all of the Olympic Day activities here. 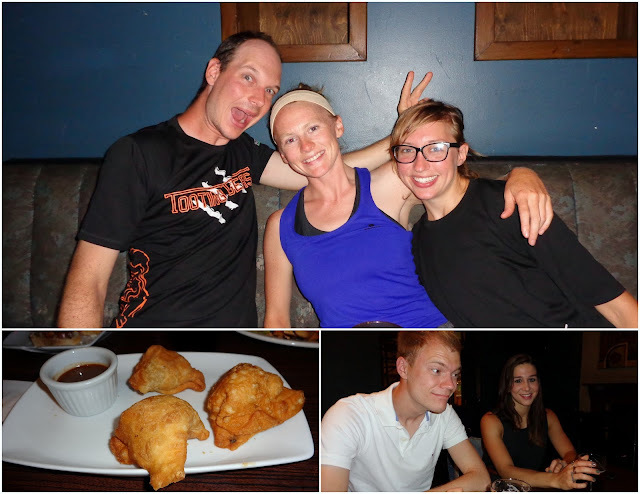 After work we drove to downtown Montreal for one of Hannah's ultimate games. This is the higher-level team and they were short their male captain, so Hermann got to play. It was a long game -- everyone played hard, and it was fun to watch. Hannah's team won! Afterwards we met up with one of Hannah's friends in a pub downtown. I had some samosas for dinner. Oh, and our waitress was from Michigan. 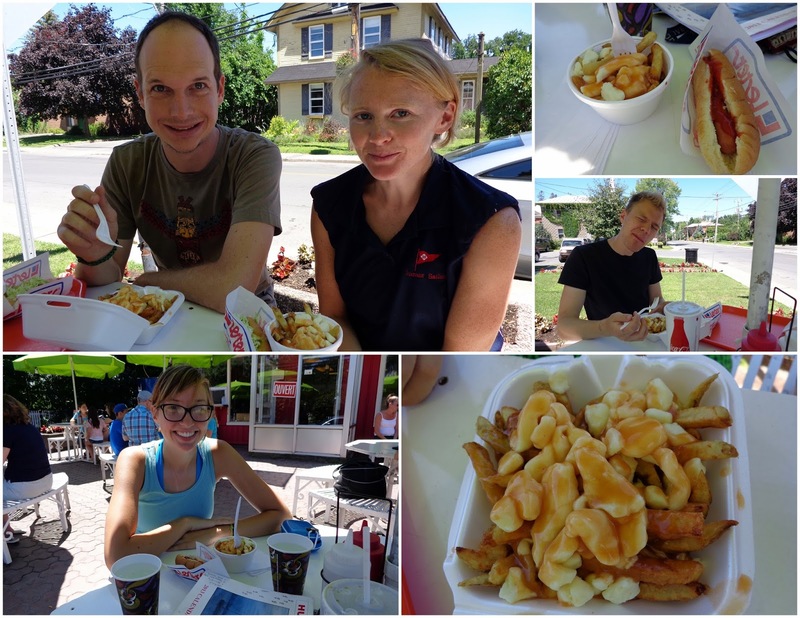 Today Hannah met us for lunch at Suave for some poutine - a popular dish in Canada consisting of french fries and cheese curds covered in gravy. 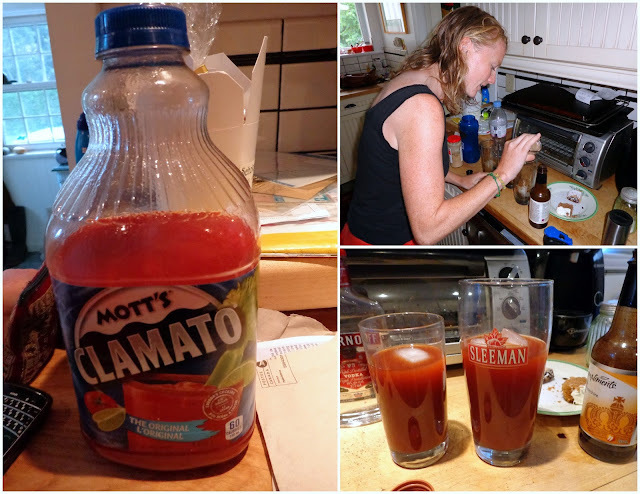 After Hannah finished work that afternoon, we went grocery shopping and did some errands/housekeeping. Hannah picked up the mail from the post office (no mail boxes in Hudson -- everyone's got a box with key at the post office) and Herm watered the plants! The boys were the ones excited to play, so it was ironic that Hannah and I owned them. 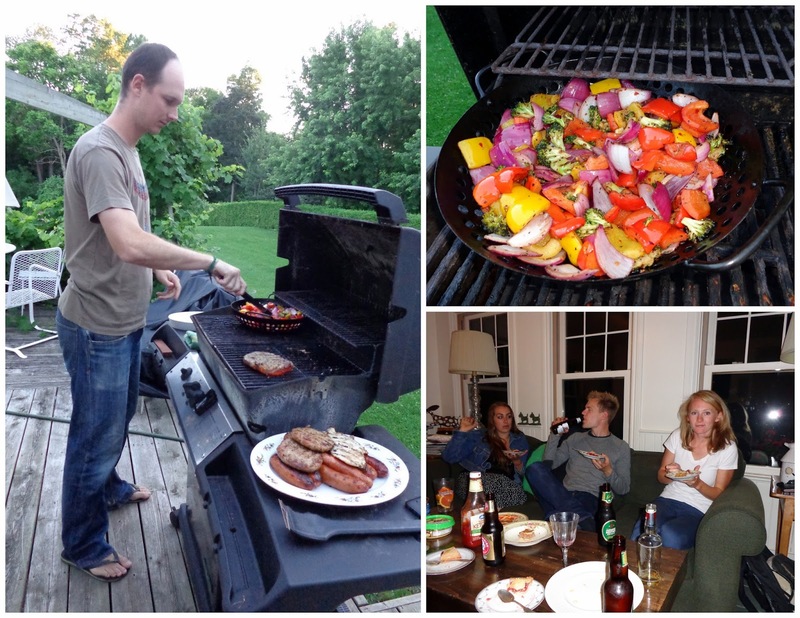 We made fajitas for dinner, then played a bit more Monopoly until it was time for bed. After the afternoon sail with Hannah's parents, we drove back to Hudson, QC. We hit a bit of a line when we got to the NY / Canada border, which I'd forgotten about. But it makes sense, on a Sunday evening. As we inched up in line, I glanced behind me and saw a "Welcome to New York" sign on the other side of the street. We weren't going anywhere, so I used the opportunity to take a confusing photo. You can see the line of cars on the left side of the photo, waiting to get back into Canada. Hannah was driving, but she would occasionally jump out to throw with Herm and I in the other lane (no cars were coming to NY from Canada). Meanwhile Max comfortably? read in the car. Crossing back to Canada was a lot easier than when we crossed to the USA on Friday night. Again, Herm collected everyone's passports as we neared the window. We made sure to have all of them this time! Imagine our surprise when the Canadian border patrol guy tells us we only had three passports. I know. Herm found the fourth on the floor of the passenger seat -- again! How this happened twice, I still have no idea. But anyway, he asked Hannah some questions in French. She answered and spoke on behalf of all of us. He returned all four of our passports and we drove on through! After breakfast on Sunday, we cleaned up the house and started packing up our things. After a visit with Hannah's grandma, we were back on the road - to New York. We met Hannah's parents to go for a sail on Lake Champlain, which lies between Vermont and New York. Her parents had been living out on the boat for a few weeks: summer vacation. Since I never got to go sailing with Hannah in Spain, I had added that item to my life list back when I started Rebe With a Clause. I'm happy to report that it has now been checked off! 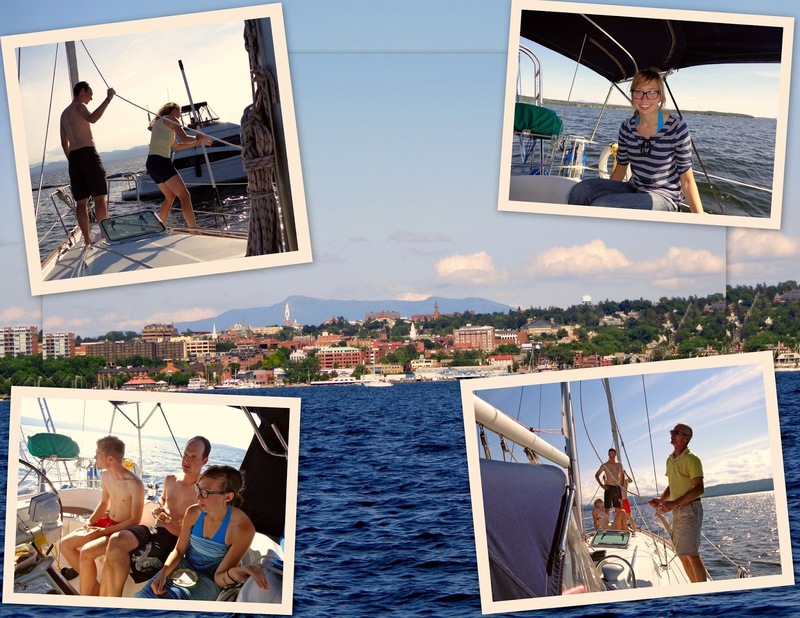 We took two trips from the dock out to the 42' sail boat, since we were so many people. Once aboard and away from the port, Hannah and her dad helped teach Hermann and Max how to steer the sailboat. We had some lunch, then swung off the boat by a rope and jumped in for a swim! I wore a life jacket; big lake waves/currents are scary. We sat down and had some dessert after the swim. Hannah's mom pulled out some old summer journals that Hannah and her sister had illustrated back when they spent their elementary summers out on the boat. 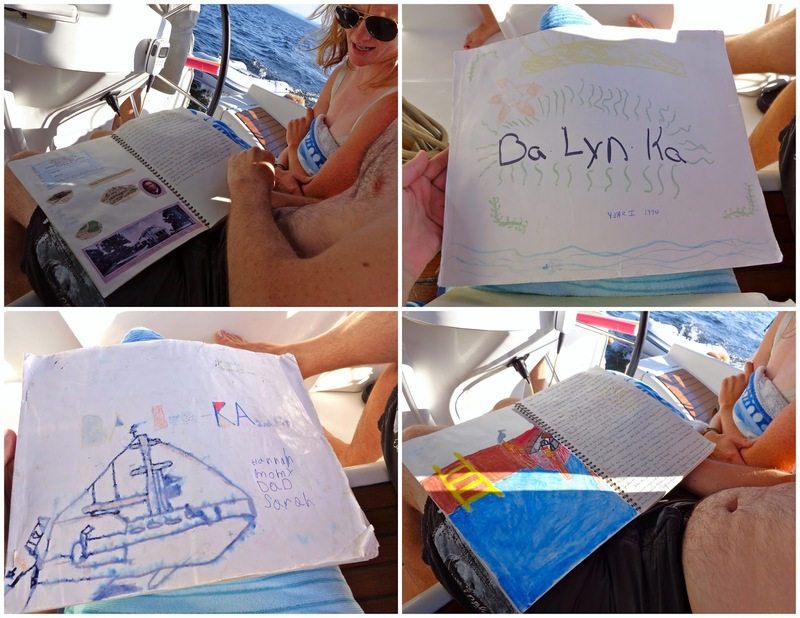 Her mom would write daily detailed entries, and the girls took turns drawing related pictures on the left-hand side. I thought it was a really great idea - a wonderful way to savor those memories. Especially when you're spending so many consecutive days in one place, out on the water, those journals must have really helped to differentiate the days. Before long, the sun was much lower in the sky, and it was time to head back to shore so we could drive back to Hudson, QC. 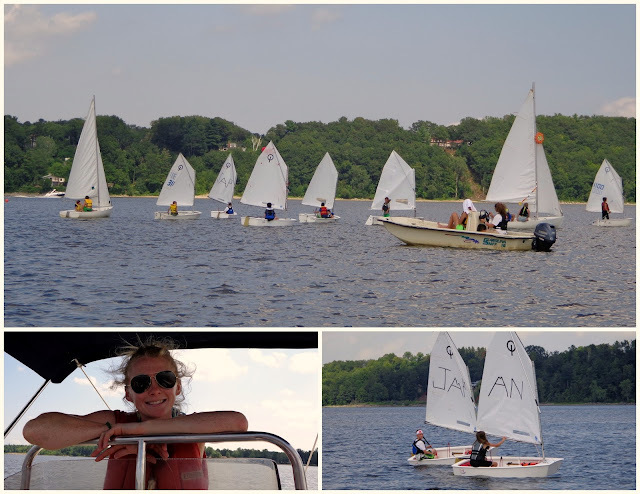 Thank you Hannah and family for that afternoon of sailing! After a long night of travel and border crossing, we were excited to explore the area on Saturday. 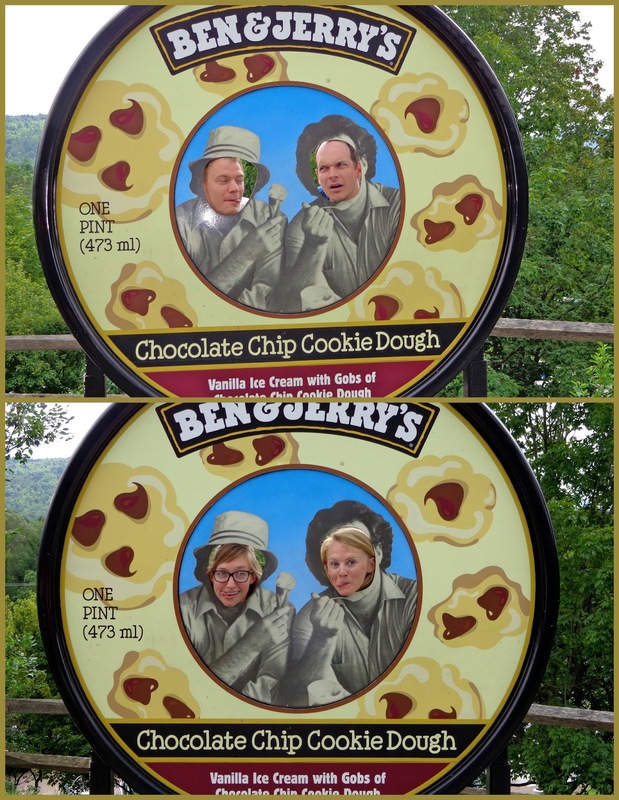 A 15-20 minute drive after breakfast got us to the Ben & Jerry's factory in Waterbury. We took some obligatory photos -- don't you think we'd make great ice cream tub artwork? We took the tour ($4), which maybe lasted 30 minutes total. It ended with an ice cream sample in the FlavoRoom. There was a sign up on the counter that read "Flavor of the day: Cheese and Broccoli". Yuck! I was so disappointed when I saw it. Turns out our sneaky tour guide had played a trick on us. 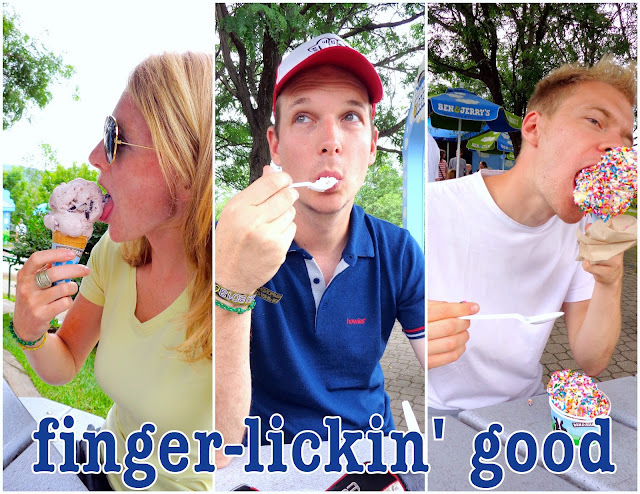 The actual flavor that day was salted caramel - or something of the sort. It was goooood. They put the ice cream samples in a larger version of the condiment cup (where you squirt ketchup into at a fast food restaurant) -- which I thought was quite genius: no spoons necessary! Just outside of the factory entrance, there was an arts/crafts booth set up for kids. 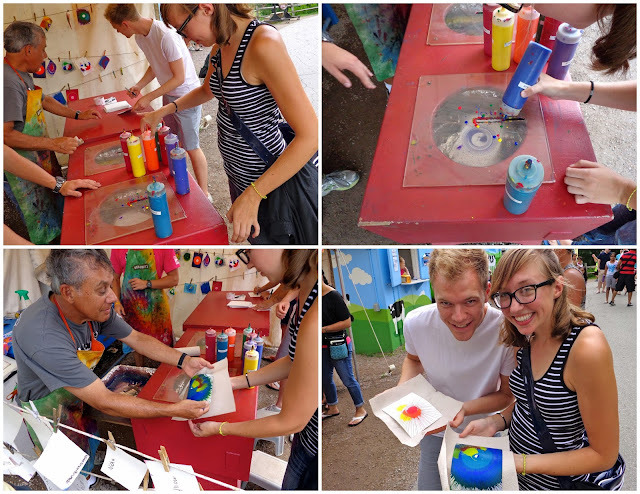 You squirt paint onto a spinning card, creating neat designs. 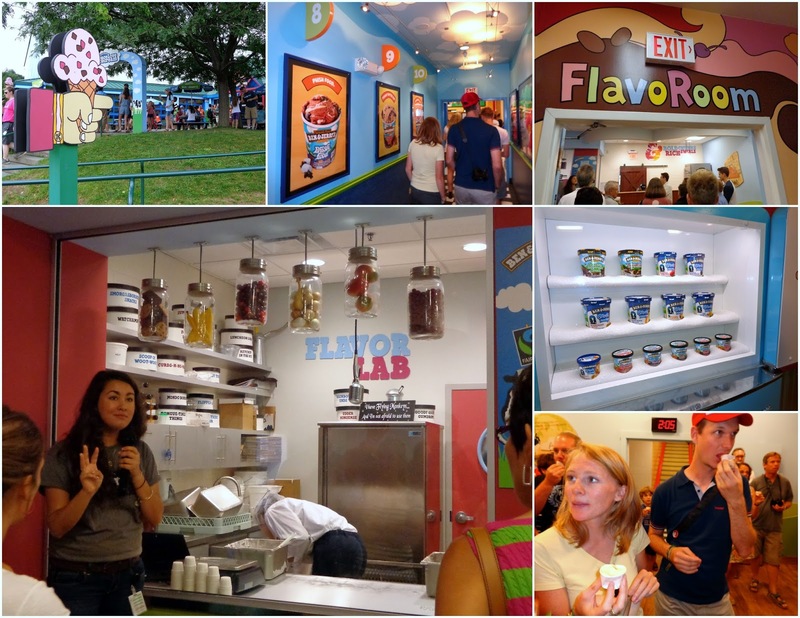 When we initially walked up to the factory, I knew I would have to come back to that booth before we left. So on the way out, I waited in line behind some six-year-olds so I could make a card. Max made one too! 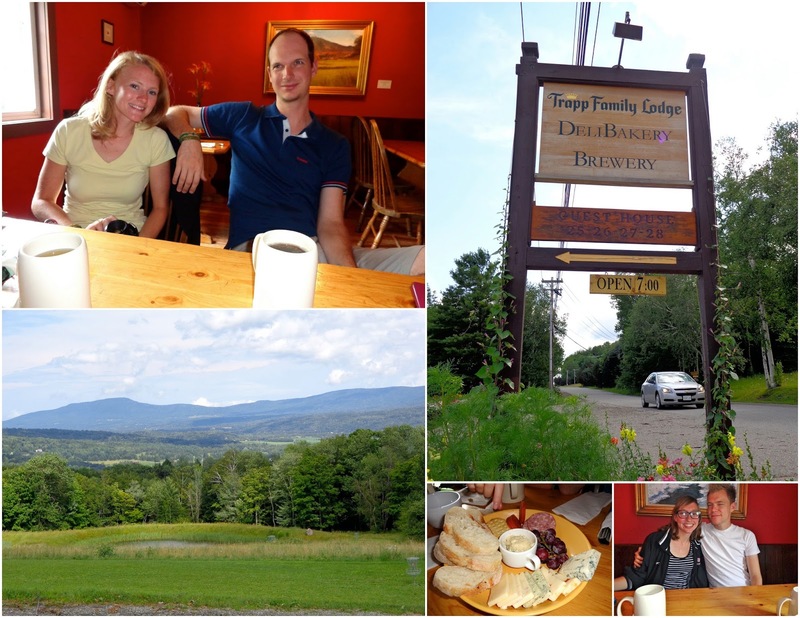 Our next stop was the nearby Trapp Family Lodge Brewery. If you've never seen The Sound of Music, stop reading and go watch it now. Or at least place a hold for it at your local library. Ok, resume reading. The von Trapps actually settled in Stowe, Vermont after fleeing Austria and touring the USA, because the mountains reminded them of home. We stopped at the Brewery for a drink, and 29-year-old European resident Hermann learned that you must have an ID with you in the states in order to be served alcohol. Luckily Hannah found his passport out in the car, so he could have a beer with us. After leaving the brewery, we went to a mini-golf place -- which by the way, the game is called "mini putt" by Québécois. 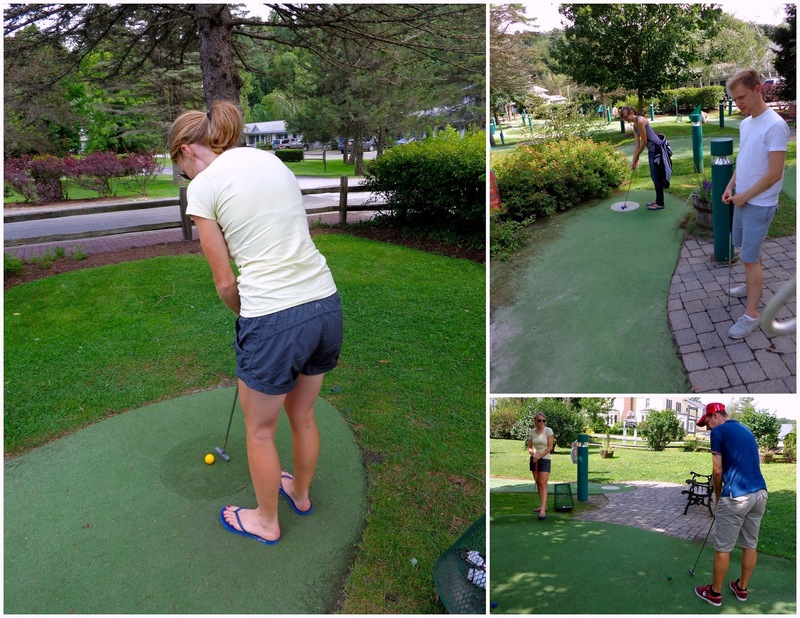 On holes 13 and 18, you won a free game of mini golf if you got a hole in one. I was doing pretty terribly for the first half of our game. On hole 13 one of the boys went first, and actually got pretty close to the hole. Then Hannah went, and she wasn't far either. The other boy went next, and I thought he almost had a hole in one. Then it was my turn. I knew there was a slim chance I'd make it in, so I just kind of swung at the ball without really taking time to line up or look at the hole. My ball made its way down the course, over a hump, curving, coming near the hole, coming closer, oh my gosh it's headed right in, IT'S IN! Hole in one! Free game! I can still hardly believe it happened. We were right by the window where we bought tickets, so I hopped over to see if I needed to do anything right away, or if we waited until the end of the game to claim my free game. I got the young worker's attention, "Um, hello?" He walks over. He's a bit of an oddball character, by the way. "I just got a hole in one on hole 13," I explained. He replied, "Well I just beat the whole game. The course record was 39, but I got 37". I responded, "Wow, when did you do that?" Uh cool, but let's not forget about what I just did! Hole in one! This is about me, me! He told me to come back at the end to get my free game. It was a coupon, so I gave it to a couple that pulled into the lot just as we were leaving. We spent the evening back at the house, grilled out, ate way too much food, drank some Canadian beer, and played some card games.